The weather is getting colder, and, even though it’s still October, there have already been some #uksnow tweets on Twitter. When I was in the Big Society Vanguard area of Eden Valley, recently, we were talking about the real difficulties which heavy snow causes in that area, which is in England’s most sparsely populated constituency. Last winter, people were snowed in for days, cut off from services and shops, and no one was able to get through to them. And people experienced real difficulties getting information about which roads were clear, which had been gritted, and when. This caused further difficulties in that people sometimes set off on journeys and then came to a section of road that wasn’t gritted and got stuck. 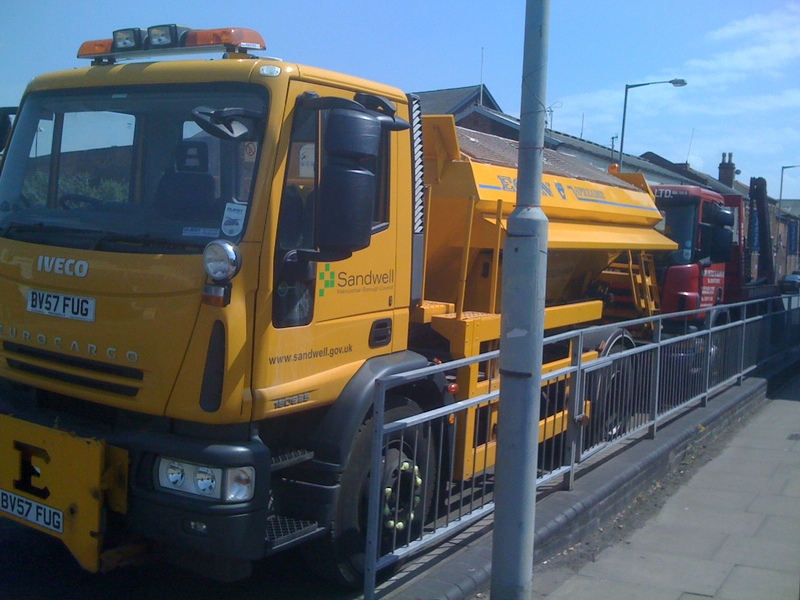 During this conversation, I mentioned the “Twitter Gritter” initiative, started by the wonderful Dan Slee at Walsall Council. Last winter Dan was giving real-time information on Twitter as gritters went out about which routes were being cleared. So, I made a mental note to speak to Dan about how he does this, what technology is involved, and how it might be replicated elsewhere. 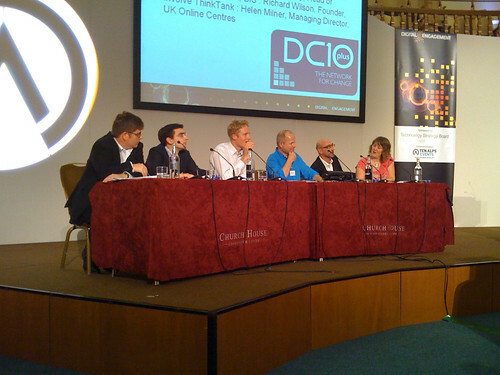 So, yesterday, on arriving at the Beyond 2010 conference in Birmingham, I spied Dan across the room, and resolved to quiz him about just how he does it. And this produced a pretty amazing revelation. Dan told me that there is no expensive technology involved. The gritter driver simply texts or emails him as they are about to set out on a route and he puts the information out on Twitter. This is one of those examples where really simple ideas don’t get spread, when the solution is so straightforward and effective. I had assumed that more people weren’t doing it because it involved some kind of expensive solution, linking GPS devices on gritting lorries with a control centre and online mapping. But, no, some of the best ideas are the most simple ones. And this is yet another example of the ability of the internet and social media to take offline information and amplify it. This could be another classic Big Society initiative. Dan is employed by Walsall Council, but, it seems to me that there is no reason why local volunteer co-ordinators couldn’t be appointed to receive texts or emails from gritter drivers and output the information to Twitter, Facebook, hyeprlocal websites, and text messaging networks. We can do this, can’t we? I’ve mentioned before how people often tell me they’d like to be a “Surgeon” at a Social Media Surgery, but they are scared about being asked questions they can’t answer. My response to that is always that it doesn’t matter. You can probably find the answer and it will be a mutual learning experience as you find your way to the answer together. Last night, I had personal experience of this, and it was just as challenging and rewarding as I had predicted. It was the First Doncaster Social Media Surgery, which now means we have nine regular Surgeries in Yorkshire & the Humber (with more in the planning stages). This one was a bit different from some of the others as, with the help of Rob Wilmot, who is chair of Governors at Doncaster College, as well as George Trow, the Principal, and Charlotte Hill, the Marketing Manager (who is a former colleague of mine), we held it at the College, and invited college tutors to join us, as well as the usual audience of voluntary and community organisations. I sat down with a group of college tutors and asked them what they wanted to learn about. They said they had heard about wikis and wanted to see if they could help them in their work. At this point, I had to admit that, although I have used plenty of wikis, I have never actually set one up. So, we spent five minutes exploring other tools I am more familiar with, to see if they would meet their needs. None of them did, however, so we concluded that wikis were where it was at. So, we embarked on a mutual learning process. I googled “wikis in education”, found a site that was crammed full of relevant wikis, spent some time with the tutors looking at examples to make sure they met the needs they had identified, found they did, and plunged into setting one up from scratch and populating it with some early content. It was a genuine mutual learning process. I learned a lot out of it, the tutors involved all agreed they had found the process both informative and enjoyable, they took copious notes so they could pick up from where we left off when they got back to their own computers. So, I now have very direct and personal experience of what I have been telling people who are nervous of becoming a “Social Media Surgeon”. I very much enjoyed it, we are all learning all the time, and I, for one, never want to fall into the trap of thinking I am “expert” at anything. 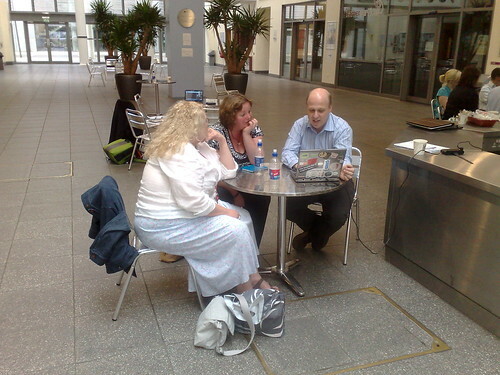 Today it was my second Social Media Social Surgery of the week (with two more to come next week). The first Rotherham Social Media Surgery went very well, considering that it was effectively planned and organised in 48 hours, after Paul Webster (@watfordgap) challenged me to respond to my own blog post “Social Media Surgeries, JFDI!“. Despite the short notice, the first venture in Rotherham was a great success, aided by the fact that we tagged the Surgery on to the end of a Social Media Workshop run by Simon Duncan, the regional Third (First?) Sector ICT Champion. 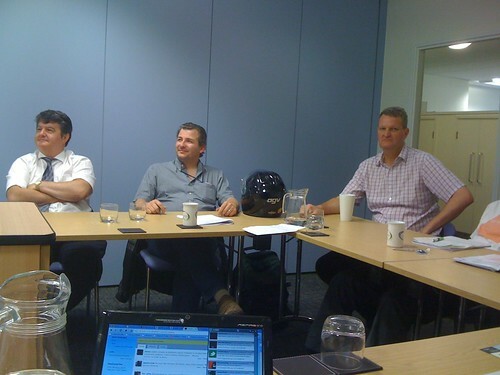 So, we had a semi-captive audience of 8 people, and my fellow “Surgeons” were Paul Webster and Neil Brewitt. This was a Surgery with a difference. It was apparent that most people present were some distance further back in their understanding of social media than those who normally come to Surgeries. So, after consulting them on their preferences, we agreed to conduct the Surgery as a group discussion, which then finished with a case study as we helped one member set up a Twitter account. Follow @lchord on Twitter, and give them some encouragement, please. This format worked well with this Group. I think it is probable that we would revert to the more usual format of one-to-one, or one-to-small-group advice at future Surgeries as people’s knowledge of, and confidence in, social media grows. But, this way worked well as a kick-off in Rotherham. Through the Digital 20/20 programme, we embarked on an ambitious programme of Social Media Surgeries towards the end of July. As well as Leeds and Huddersfield, delivered with the usual estimable team of volunteers, Ben McKenna led the first Bradford Social Media Surgery on the 20th, and then we have firsts in Rotherham, on the 21st, and Doncaster on the 28th. These are rounded off with the second North East Lincolnshire event in Grimsby on the 29th. I appeared on Radio Sheffield on the afternoon of Tuesday 20th July (well, it makes a change from being up at the crack of dawn for the Breakfast Show), to talk about the Rotherham and Doncaster Surgeries, as well as getting a plug in for the regular Sheffield Surgery. Social Media Surgeries – JFDI! I’ve had to abort plans for two new Social Media Surgeries recently because other people got cold feet about being able to attract sufficient numbers of participants. Now, while I wholeheartedly agree that it makes no sense to take up time and resources if no one is going to come, and I have cancelled a session myself in the past because of this, I also think that this is an activity where waiting for the perfect moment is counter-productive. 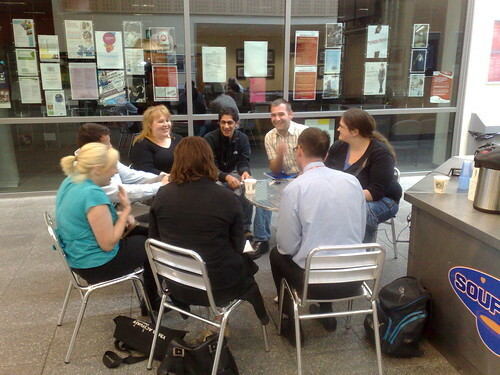 My experience with Leeds Social Media Surgery, for instance, is that, even though we started there with quite low numbers, the Surgery has built its own momentum. 1. It gives you stories to tell. Even though you might only have a few takers at first, every episode of assistance at a Social Media Surgery is a story in itself. Surgery organisers can tell these stories as examples of the benefits people get out of attendance, and this is great publicity in the local area. 2. It builds word of mouth We have found in Leeds, as elsewhere, that people are now coming to the Surgery because they know someone else who has attended and got something positive out of it. This is a very important factor when many of the people we are trying to reach with Social Media Surgeries are (a) not necessarily online that much, and therefore relatively immune to online marketing; and (b) nervous about social media use, and thus more likely to take the next steps if they know someone else who has done the same thing. So, if you’re thinking of starting a Social Media Surgery, I’d say, “do it!”. There may never be a perfect moment, and a slow start is better than no start at all. Listening to Michael Palin being interviewed on Danny Baker’s radio programme on BBC Five Live this morning gave me some food for thought. He was talking about the publication of the latest volume of his diaries, and, in particular, about the process of sifting the content of his original hand-written diaries to decide what was suitable for publication. The gist of what he was saying was that, while there is a lot of mundane trivia in the diaries, he felt it was important to include some human detail because it helps to give a rounded picture of the author. This set me thinking. One of the things that people who have not “got” Twitter yet, is that it is “full of trivia”. They say things like “why do I want to know what you had for breakfast”. And my response to that, is that I use Twitter for serious purposes, but that some, at least, of the trivia, is what makes Twitter so engaging. I may get lots of useful information from my Twitter contacts, but, I also get to know them as people, because of the trivia which surrounds the useful information. Thus, Twitter allows me to feel that I am part of a team of people with similar objectives, many of whom I have never met face-to-face, but have a pretty good idea of what kind of people they are. And that also helps when I DO meet people face-to-face. It breaks down many of the initial social barriers which might otherwise be experienced on meeting someone for the first time. So, this leads me to think that Twitter is living biography. No longer do we have to wait for the publication of someone’s diaries, through Twitter, we can experience their biography in real time as it happens.